Go mountain biking through a remote natural area without the risk of getting lost, on this convenient day trip from Manila. Your guide will lead you along dirt roads, single tracks, across rivers, and to a tribal settlement. 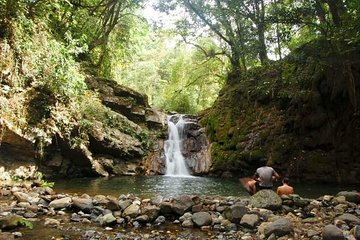 Once you reach the Kinabauan Waterfalls via a short hike, there is a chance to cool off in the refreshing waters. A fun day out for active travelers who enjoy nature.